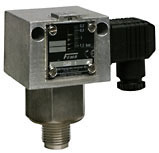 For monitoring and controlling pressures in devices of the chemical industry and in the process engineering as well as wherever the pressure of aggressive liquids and gases has to be monitored. Housing material rugged housing of seawater resistant aluminium die casting GD Al Si 12. • -213: gold-plated contacts, switching capacity: max. 24 Vdc, 100 mA, min. 5 Vdc, 2 mA. And others not available with adjustable switching difference.